Want to build rock solid upper body and core strength? Then the Overhead Press is the answer. The Overhead Press (also known as the Strict Press or Shoulder Press) is a compound exercise that involves lifting a weighted barbell overhead to a fully locked out position with the strict use of the shoulders and arms. 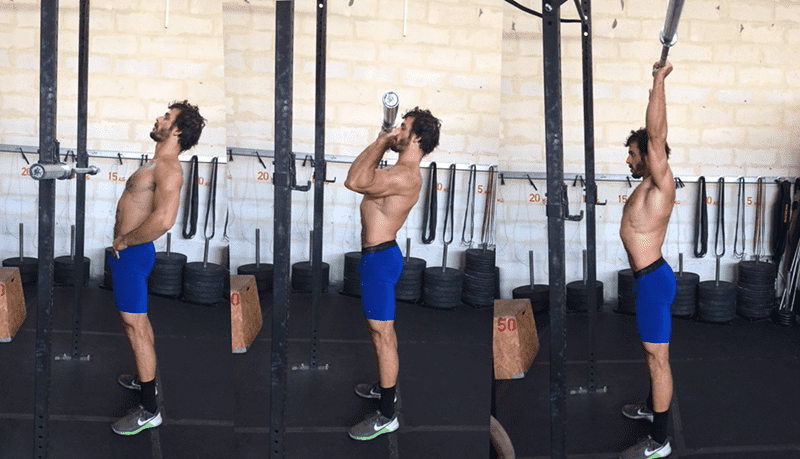 Pressing the bar overhead is still one of the most useful upper body exercises you can do. This highly effective exercise involves the entire body. Your feet, legs, glutes, core, abs, hips, ankles and wrists help to stabilise the body whilst your shoulders, upper chest, back and arms press the bar overhead. The Overhead Press has a long kinetic chain – from the overhead extension at full arms length to the floor. In comparison with the bench press, where the bench supports you, your entire core has to work to stabilise the weight. This makes pressing an incredibly effective core exercise. During the Overhead Press, the supraspinatus, the infraspinatus and the teres minor (which are attach on the posterior scapula to the humerus) work as stabilisers and are therefore strengthened. These three muscles provide external rotation as well as deceleration of internal rotation. You need these muscles to be strong otherwise injuries can and often do occur. Athletes who only Bench Press tend to have more shoulder problems than those who include overhead training. This is because when pressing on a flat bench the force is directed at a rough 90 degree angle away from the trunk, while in the Overhead Press it is vertical. As with any lift, progress and avoiding injury lies in great technique. The Overhead Press starts with an empty bar at the rack. Same height as for the Squat meaning mid sternum. Same stance as squat. Your grip width is such that it places the forearms in a vertical position. index fingers are somewhere between the edge of the knurl and a half-inch out from the knurl. Big dudes will need a wider grip to keep the forearms vertical. Don’t grip too wide so that your forearms bend outwards. When you take the barbell out of the rack, it should be on the heel of your palm and directly over your forearm bones, with the elbows just in front of the bar when viewed from the side. 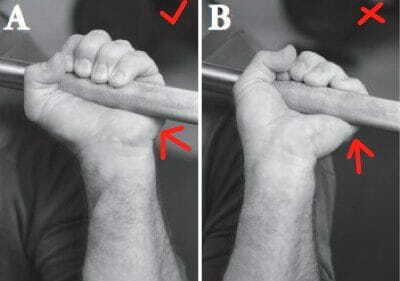 Most folks place the bar on their fingers which will eventually lead to wrist problems. Your forearm and wrist should be in a straight line. Rest the bar on top of your anterior deltoids. Look straight ahead to a point on the wall that is level with your eyes (focus on this point for every rep). Now, lift your chest up. Lifting your chest creates a back contraction, produces tightness in the upper back. This makes your connection to the ground more stable and improves your pressing mechanics overall. You are now set to press. Take a deep breath using Valsalva maneuver technique, and drive the bar over your head. Remember that bars like to move in a vertical line, especially when they are heavy. So keep in mind that when the bar moves towards your chin, you should move your chin back and not the bar around your chin. Make sense? When the bar passes the forehead, shoot your head forward back to its normal resting place. When you reach the top, the bar should be in a vertical line with the glenohumeral joint and mid-foot. When you press overhead you finish the movement by shrugging your shoulders up towards the bar for full extension. This produces a stable position at the top that involves all the shoulder girdle muscles and prevents shoulder impingement. Now that you know where the bar should go, what’s the best way to get it there? The vertical bar path must be produced in a way it takes the load from the shoulders to the lockout position plumb to the shoulder joints with a motion of the hips. With hands on the hips (no barbell needed), shoot your pelvis forward so your weight transfers onto your toes, without bending your knees or lumbar spine [see picture below]. The torso drives forward as the bar drives up. Your weight should be shifted therefore to your toes and then back to the mid foot as you re-center the weight at lockout position. This movement will not involve pulling the hips back, but rather rebounding the hips off the tension. Like drawing a bow, the maximum tension will be at the furthest point of the movement and the tension will drive the hips back. 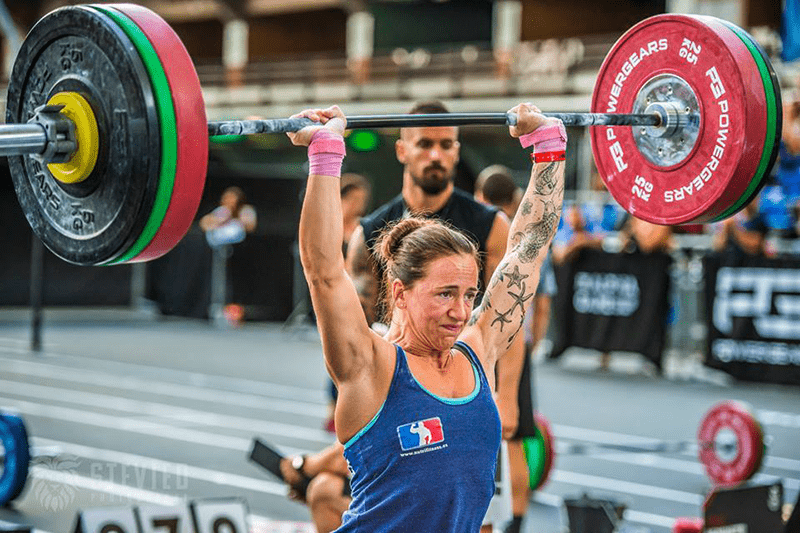 As a crossfit competitor I need my upper back muscles, shoulders and core to be as strong as possible to improve my overall performance during any overhead movements. Personally, I like to use the Overhead Press as a complex with Split Jerk. For all my Crossfit friends, strong shoulders, upper back and a solid core will only have hugely positive effects on your performances. The Overhead Press is a great full body compound exercise to build the strength you need to become an even better athlete.